These days choosing a camera around £500 is tricky. You can pick a DSLR like the Nikon D3300, or you could go for a mirrorless Micro Four Thirds camera, or even a top-spec compact instead. That makes the selection process even harder than ever before. Given the choice, we would always go for an interchangeable lens system, because these cameras can grow with you, and the hardware is very capable at producing amazing images. Of course, this is matter of taste, and what works for one person won't work for another. Assuming you pick a DSLR, what does the D3300 offer? Largely, it's the very same camera as its D3200 predecessor. There are some improvements, like a boost in sensitivity and a newer images processing engine. Does that add up to enough to make this camera worth buying over others in the similar price range? We took the D3300 to some challenging locations to put it to the test. You could get snobby about a sensibly-priced DSLR, and of course there are some minor compromises made to achieve the price point the D3300 camera sells at. Noticeably, it's built from plastic and doesn't feel as solid or accident-proof as Nikon's pricier cameras. But that also means it's a lot lighter by comparison too. You can buy the D3300 with or without the kit lens, and in three different colour options. Our advice would be to get it with the lens and in black because the other two colours - the red and grey-ish options - don't appeal to us, but some might disagree. It's really worth getting the kit lens, because it's versatile and compact. We have to say, the quality of it also impressed us quite a lot. The included 18-55mm kit lens has a plastic exterior, including the connecting ring that interlocks with the body to keep it in place. In practice, while these all-plastic lenses aren't ideal, they don't really cause any problems. We've been using a years-old Nikon D90 and its kit lens for years now and it's never given us any real problems. The D3300's new kit lens is nice and light, which complements the camera body, keeping the whole thing nice and portable. To keep the size down this new lens retracts into itself and locks in place when you're not using it. When you want to take a photo you must push the round button on the barrel to unlock the lens. Once you do this the lens is obviously physically larger due to extension, but it's well weighted and easy enough to use. It's all an advantage compared to the earlier D3200 kit - Nikon has caught wind of the demand for smaller and lighter kit. The zoom ring is a decent size, but if you opt for manual focus the ring to adjust that is much smaller and much more fiddly. This means that while you're trying to lock on to something, you might have to fiddle a bit more to find the ring, and if you have big fingers - no shame, we do - then you might find it hard to rotate too because your finger might overlap onto the barrel of the lens. We liked the results from this lens. Its range is good, 18-55mm (27-83mm equivalent) is really useful for a lot of photography, with 18mm being wide-angle enough for landscapes, and 55mm making for ideal for portraits. In-between the range can cater for all manner of shots. The aperture value - that is the amount of light that can enter the lens - starts at f/3.5 at the wide-angle end and dips to f/5.6 at full extension, which means this lens isn't the fastest by any stretch and you'll need to compensate exposures by adjusting other settings accordingly. Low-light photography will push the ISO higher to get blur-free results, for example. If you do want to switch for a different lens - and there are a whole lot available - do remember that the D3300 doesn't have an internal drive motor, so lenses that use that system, such as Nikon's amazing and cheap 50mm f/1.8, won't be able to autofocus. That might not be a huge worry, though, as there are over 150 lenses available (if including third-party manufacturers) that will work no problems. Autofocus using the kit lens is decent enough. More advanced lenses may produce faster, better results, so the D3300 is limited or expanded by what glass is on the front. In auto mode, you'll get auto-servo AF or you can select manual focus - you can also do this on the lens barrel with the kit lens. You can select single point, dynamic area, 3D tracking or auto-area modes from the menu. Which of these you get on best will probably depend on the sort of photographer you are. We like centre single point, because it gives you a reliable way to lock on to what you want and you can then move the frame - within reason - to recompose for the perfect shot. The more automatic modes all give good results, albeit somewhat slowly at times, or they might lock onto the more obvious subject when you're trying to do something clever with a less obvious subject within the frame. Dark environments are compensated for by the on-camera focus-assist light, which is a bit disruptive, but does really help with faces when the light suffers. This can be switched off if you don't like it, but will make low-light autofocus all the trickier. Overall we think that some compact cameras and mirrorless interchangeable models can be more rapid in the autofocus department, but you can get good results from the D3300, even though it isn't the fastest out there. Compared to a DSLR costing around £800-1000 one key difference is the amount of buttons the D3300 has to offer. In some ways simplification is to be applauded, especially if the camera will end up being used in auto mode a lot. This does, however, cause some problems if you want to attack stuff in manual modes. The big problem we noticed was that with only one mode dial, you can't quickly adjust the shutter speed, ISO and aperture settings. It's all possible by pressing shortcut keys, but this is a bit more time-consuming. Once you're used to it and the camera is set up as best as it can be for your needs it presents no real problem though. In terms of how the layout works though, it's actually quite smart and the buttons are easy to reach when you're shooting. Out only complaint is that some of the buttons are small, which can cause minor problems when you're in a rush. The D3300 has a rear LCD display that's of ample quality. In common with most cheaper DSLR cameras there's no mini LCD display on the top of the body to display the shooting settings, battery level, number of shots remaining on the SD card and so forth. Instead, this info is sent to the screen at the rear and it's nicely laid out in a graphical arrangement. The resolution of this main LCD display is nothing special at 921k-dots - although that's around three times the resolution of earlier entry-level models - but it's good enough for reviewing images, and it does a really good job with those menus. Live preview - the method of using the rear LCD screen to preview a shot as you would on a compact camera - has the same bundle of issues it always tends to on a DSLR though. In short: if you want to use the camera's rear screen rather than a viewfinder then a DSLR is unlikely to be for you. In the case of the D3300 the autofocus speed slows down considerably, battery consumption is made all the worse and it's a general hassle - we can't see why you'd use it when you have that optical viewfinder. On the other hand, for video capture it's essential, and here it works well enough. One of the more significant changes from the D3200 to D3300 model is that the ISO sensitivity has been increased. This is the camera's capacity to adapt for dimmer lighting conditions by processing a correct exposure. But low light, shot at higher ISO sensitivities, also amplify digital noise in the signal that can show up as mottled flecks of colour in that image. So while the ability to use a high ISO setting can be useful, it's not something you'll want to use by default. At the top end, the D3300 can be pushed to ISO 12,800 and even higher with Hi1 which is an artificial boost to an ISO 25,600 equivalent. Results at 12,800 are noisy, as you would expect, but they're not atrocious by any means. And while we wouldn't recommend you use it for photos you want to keep or print, if you're in a bind, and need to shoot in very low light it will suffice. It's good to have. Results at ISO 6400 are reasonable enough but, again, there's visible image noise and the processing makes images softer too. We suspect that cameraphones mean people are a bit more used to digital noise now, so images taken at this ISO will probably be good enough for most if you're just going to share at smaller sizes. The good news is that up to ISO 3200 things look great. Additionally, Auto ISO does a nice job of setting the camera up for use so that if you don't know the ins and outs of shooting it'll take care of that for you while allowing enough control to still be at your fingertips - if you want it. We found ourselves much less inclined to manually set the ISO than we have been on other cameras. The big question: does this all add up to the Nikon D3300 delivering big the image quality department? The answer: yes, we certainly think it does. The 24.2-megapixel sensor gives big images, perhaps bigger than you need, and they are pretty sharp. Zoom in to 100 per cent scale and you can see some of the softness towards the edges courtesy of the kit lens, but the image noise is well managed by the Expeed engine in most cases. For the most part, no one really needs to view at 100 per cent scale unless printing or utilising images at a large scale, or cropping in significantly. Even so, you can see from the sample images we've included that the camera does have what it takes to produce great pictures. The natural colour balance of JPEG files is impressive too. We quite like the way Nikon balances its compression and processing. There's loads of colour in shots, but it's never overdone and the resulting pictures have an impact that will impress those upgrading from a compact camera. We played around with manual, aperture priority, shutter priority and full manual modes and found the images the camera produced to be very good throughout. For most use though, the automatic mode was good enough to make it our first choice. The metering of the camera seems to be about right, and that makes for better results in auto than you'd expect from compact cameras - assuming the flash doesn't persist to pop up when it's not wanted or needed. Maybe we're old-fashioned, or just plain wrong, but for us DSLR photography is about the art of taking photographs, rather than the art of applying a filter to a photograph. But even so, the D3300 comes with a few options built-in, some of which are more useful than others. Of the 13 filters included, you might get some use out of the panorama, which is simple to use and works reasonably well. The camera auto-detects movement, so once you've pressed the shutter button to start the process there's nothing much else to do except decide if you want to pan or tilt the camera. There are also the less useful features like a faux tilt/shift, the usual posterization and adjustment modes and the ever-present selective colour. They might be fun for some, but they're no doubt just as easy to apply after the fact in photo editing software, and with better results. If you're interested in this sort of thing, Nikon's offering is fairly middle-of-the-road, but with good pictures to work on it usually turns out well enough. We wouldn't go so far as to describe £550 as a bargain, but we do really like what the D3300 offers for the price. The new collapsible kit lens is great, especially for the kind of people buying this camera. As with all kit lenses though, the speed is on the slow side, especially when autofocusing at 55mm. This will have an impact on using it in low-light levels, which will force the camera to compensate with either a high ISO, or slower shutter speed. People who get bitten by the photography bug will buy improved lenses though, and will really enjoy the upgrade this offers. But do bear in mind that it's easy to spend more than the cost of this camera on a single lens upgrade. In terms of operation, the compact size and weight of the D3300 mean it's fantastic to take around with you. It's ideal for stashing in a bag, and its modest weight won't weigh you down. Ergonomically, it's a nice fit in the hand too, even if you've got massive spades on the end of your arms. As with any camera the main thing that matters is what the photos look like. And it's here that we're coloured impressed by the D3300. Images are detailed, bright and well-balanced. What's more, the auto mode does a really good job, even in fairly difficult lighting, which is fitting for an entry-level model. We felt happy leaving the camera to handle all the settings. The only thing to throw a spanner in the works is what's happening elsewhere in the market: the Canon EOS 1200D confuses things a little because it's a lot cheaper despite a similar spec; while there are all kinds of compact system cameras with interchangeable lenses and faster "live preview" modes that may suit a wider audience. 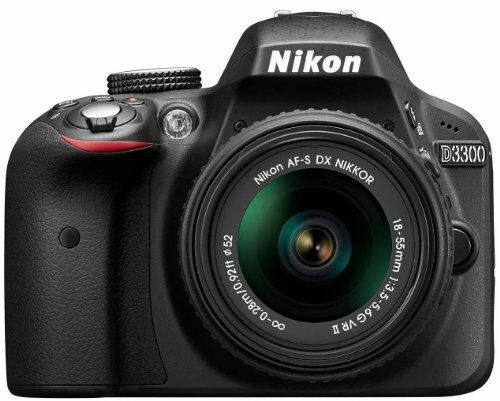 But if an optical viewfinder is a must then the D3300 is an accomplished entry-level DSLR well worthy of consideration.